"I only need page 95. It is my destiny." I see a bit of myself in Kumiko. I think most people will if they look hard enough. My days are not made up of loneliness or suffering or even the slightest bit of depression, but I too have unfulfilled dreams. Each day I wake up and do what is necessary to make today great and tomorrow even better for my wife and daughter, but it is a soulless exercise in daydreaming and counting minutes. I am proud of the work I do but deep down my soul screams for professional passion. When I close my eyes, I don't envision a world in which I am a rock star or an athlete. I don't desire attention. I don't crave a spotlight. I don't calculate success by imaging extra zeroes at the end of my paycheck. Success is supporting the ones you love doing what you love. Success is establishing your dreams and never giving up until you achieve them. When I close my eyes, I see myself watching a film much like this one and getting lost in the story. I want to get to know characters both based on fiction and fact. I want to soak in a pool of realism one day and then soar away to new fantastical worlds the next. I want to write about what I see and feel and be proud of the words I use. I want to believe that my friends and my family are proud too. I want someone, anyone that I have never met before to read something I write and have it inspire them to seek out a movie they may have otherwise not. I want those films to move others the way they so often move me. 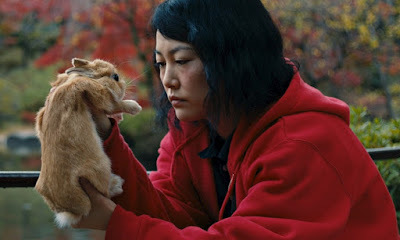 Kumiko lives in Tokyo and her only companion is a pet rabbit named Bunzo. When she is at work, her boss questions why she has not yet married. When she speaks to her mother, she questions when Kumiko will start a family. Her life is marred by an absence of passion and being forcefully guided by archaic gender roles and the expectations of others. Deep down she dreams even though the world around her tells her not to. Kumiko has an obsession and an unusual one at that. She watches a VHS tape of Fargo by the Coen brothers on repeat believing it to be based on true events. She dreams of searching for the buried fortune that has seemingly never been found. One day she finally gives in and leaves her world behind, a journey to America. Fargo, North Dakota. Short on money and a grasp of the English language, Kumiko refuses to quit. She refuses to turn around and go home no matter how bad it gets. Under-dressed and relying on hand drawn maps, she searches for that fence in the middle of a barren sea of snow. 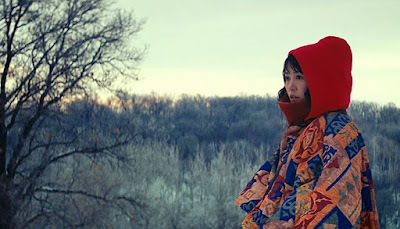 Kumiko, the Treasure Hunter is gorgeously shot and has a haunting, lyrical flow to it that might not work for some but for me it was magic. The lead performance from Rinko Kikuchi is powerful and if you look through the oddness of her quest, what you will find is a woman who is pushed to the brink by a world that won't allow her to transcend stereotypes. A world that won't allow her to pursue her dreams, no matter how absurd they might be. Many will find her tale ridiculous. I find it inspiring, and the absolutely sublime ending is the icing on the cake. Somewhere out there in the middle of a vast sea of beautiful snow, my dreams are buried. They are out there and they can be found. They can be realized, and I won't give up. But I am still searching.